Halloween fun doesn’t stop after your childhood years. Your college years are some of the best of your entire life, and Halloween is a holiday filled with parties that you’ll never forget! The excitement of Halloween can start in your own dorm, from the lobby to the hallways, from the dorm rooms to the windows. There’s lots you can do to decorate your dorm for Halloween! First off, decide what type of Halloween mood you want to set. Will it be a super spooky mood in which residents will be scared to see what lies around the corner? 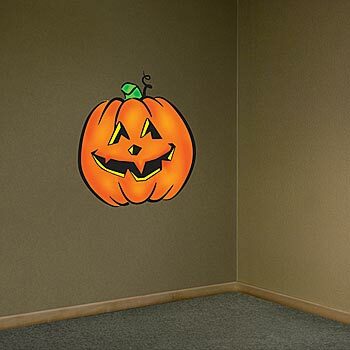 Or will it be a fun and light mood in which smiling jack-o-lanterns line the walls? Pick a theme and stick with it so there will be some continuity throughout the dorm. Everyone has to come in through the lobby, so this area should be exceptionally decorated. Creep people out with plastic window scenes before they even enter the dorm. Pick from the Green Demon or the Menacing Mummy. Inside, cover everything in the lobby with cobwebs – the front desk, chairs, television, tables, corners of rooms, etc. etc. And if you’re going to have cobwebs, you’ve got to have spiders! Whether you cut them out of construction paper or use clip on crawlie rings, spiders are a must. Since people will come to the front desk in the lobby for a variety of reasons, it might be a neat idea to have a spooky candy dish or even a plastic pumpkin filled with candy. One way you might include everyone is to have each hallway pick their own theme and decorate it however they like. It could even be a contest to see who has the best decorations. Getting everyone involved definitely makes it more fun. Remind everyone of the fire codes and that their decorations cannot block people from easily getting through. Because you will be limited in space as far as what you can put on the floor, consider some Halloween hanging decorations. Cover the walls with dark paper and black gossamer for a dark, spooky vibe. For a morbid touch, put personalized tombstones on each dorm room door. Your individual dorm room may be all you have control over if Halloween decorations aren’t allowed elsewhere, or if someone else is in charge of that. But your room is your own space! It might not be big, but there are still lots of Halloween decorations you can put up. One way to set the Halloween mood in your dorm room is with lighting. It might be something as simple as a black light. Make sure whatever you decide to use as mood lighting is approved by the head of your dorm. Decorate your walls and windows with spooky decorations, maybe even a personalized banner with you and your roommate’s names on it! Have fun decorating your dorm for Halloween. Whether you’re in charge of the entire dorm or just your dorm room, there are hundreds of ways you can use Halloween decorations and be the talk of the campus! While many people decorate the interior of their homes and outside lawns, Halloween garage decorations often get overlooked. Surprise everyone and decorate your garage this year! Here are 5 Scary Halloween Garage Decorating Ideas and 5 Not so Scary Halloween Garage Decorating Ideas. Imagine the reactions when your garage door opens and this is revealed! 1. Drape polyester cobwebs from the garage ceiling and walls. Add a giant fuzzy spider (or two) tucked into a corner for an extra surprise. 2. Replace the light bulbs inside and outside your garage with red bulbs to cast a scary red hue. 3. Plug in a fog machine, fill it with fog liquid and set it on an evening timer. Enjoy the surprised reactions of your neighbors and visitors as fog pours from your garage! Remember to add extra fog liquid each time you use the fog machine. 4. Prune a couple of low-lying branches from any overgrown trees on your property, spray paint them black and place the painted branches in a sturdy black bucket outside of your garage. Hang the Bloody Weapon Garland from the branches. 5. 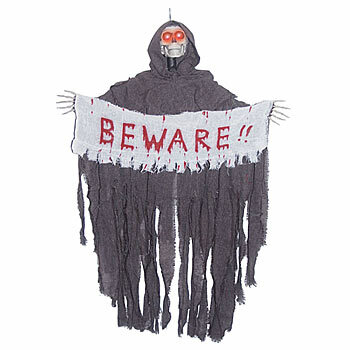 Attach the creepy Hanging Reaper from the garage ceiling to finish off your super scary Halloween garage decorations. 2. Hang a colorful, vinyl Halloween banner on the outside of your garage and personalize it with your name. 3. Twist together orange and black crepe streamers and tape them to the walls of your garage for a colorful burst of Halloween spirit. 4. 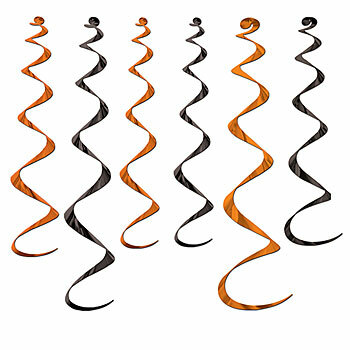 Affix Orange and Black Twirly Whirlys to the ceiling and enjoy the way they dance each time the garage door opens and closes. 5. Collect an assortment of orange and yellow pumpkins and gourds, place them in re-purposed flower pots spray painted black and put the pots on either side of your garage door. Halloween decorations add to the excitement of the approaching holiday revelry, and they provide an opportunity to express your personality: Will your Halloween decorations be scary or not so scary? This Halloween, open your garage door and share your personal Halloween preference with everyone!